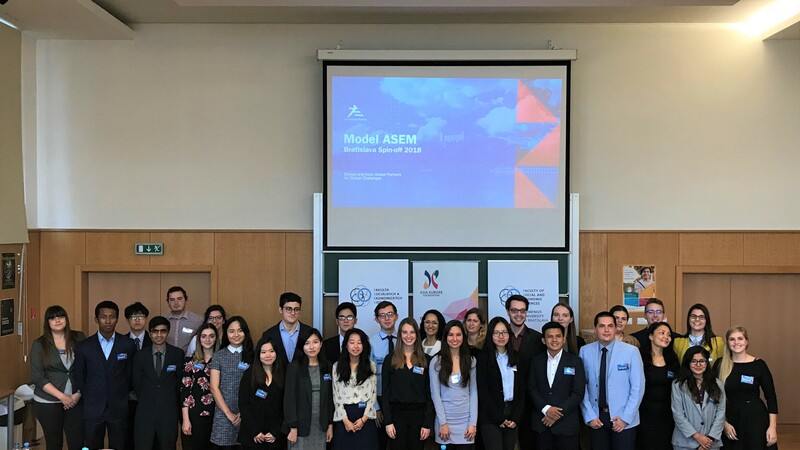 Model ASEM Bratislava 2018 is a part of the Model ASEM spin-off editions that will take place at the Faculty of Social and Economic Sciences of Comenius University in Bratislava from 26 to 28 October 2018. The main goal of the Model is to provide an educational platform for young leaders from the ASEM Partner countries and to increase interest in ASEM process and Europe-Asia cooperation in general among students from countries of Central Europe. The Model will bring together 53 young delegates from ASEM Partner countries who will engage in a political simulation of ASEM Foreign Ministers’ Meeting. After the opening Plenary Session, the Delegates will be divided into respective thematic Working Groups in which they will debate on the Model’s theme in order to develop the content of the Chair’s Statement, which will be adopted during the closing Plenary Session. The main theme of the Model is “Europe and Asia: Global Partners for Global Challenges”.